Pioneers in the industry, we offer tenvir tablets, tenvir em tablets, ricovir em tablets and hiv treatment medicines from India. 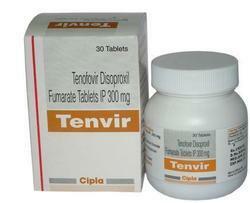 Tenvir is an antiretroviral medication that treats HIV-1 in adults when taken with other anti-HIV drugs. One tablet contains 300mg of tenofovir disoproxil fumarate. It is highly effective, yet Tenvir must be part of a regiment of multiple antiretrovirals to stop HIV-1 from progressing to AIDS. One 300mg tablet should be consumed orally with or without food once a day. Because Tenvir has been documented to affect kidney functions, patients with a creatinine clearance of 30-49 mL/min should only take one dose every 48 hours. Those with a creatinine clearance of 10-29 mL/min may take one 300 mg tablet two times a week, while patients undergoing hemodialysis should be restricted to one tablet every seven days or 12 hours after dialysis. Anyone hypersensitive to tenofovir disoproxil fumarate should not take Tenvir. Renal impairment or failure,Interstitial nephritis,Fanconi syndrome,Hepatomegaly with steatosis,Lactic acidosis,Tubular necrosis,Nephrogenic diabetes insipidus. Other adverse effects have been reported by patients taking Tenvir. Let your doctor know if you experience any changes in your physical or mental health after beginning to take Tenvir. Some patients show symptoms of immune reconstitution syndrome when first starting Tenvir. Patients with hepatitis B can experience acute exacerbation of hepatitis symptoms after they discontinue tenofovir disoproxil fumarate. The safety and effectiveness of administering Tenvir to patients co-infected with hepatitis B and HIV has yet be established and hepatitis patients should be closely monitored for several months after they stop using Tenvir. Patients taking Tenvir have also reported loss in bone mineral density and osteomalacia. Taking nephrotoxic drugs with Tenvir might increase the risk of renal implications. 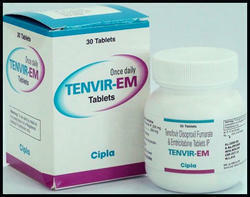 Tenvir EM is used as part of a regiment of antiretroviral medications to treat HIV-1 in adults.A single tabletl contains a combination of two anti-HIV drugs emtricitabine and tenofovir disoproxil fumarate; however, Tenvir EM must be taken with at least one other anti-HIV medication to prevent HIV from progressing to AIDS. Tenvir EM is taken orally once a day, at the same time every day, with or without food. Because Tenovir can cause renal impairment, patients with a creatinine clearance of 30 to 49 ml/min should only take one tablet every 48 hours, and patients with a creatinine clearance of less than 30 ml/min should not take Tenvir EM at all. Patients hypersensitive to either emtricitabine or tenofovir disoproxil fumarate should not take Tenvir EM. Discoloration of palms and soles,Abnormal triglyceride levels,Abdominal pain,Lactic acidosis,Anorexia,Hepatotoxicity,Flatulence. Other adverse effects have been reported by patients taking Tenvir EM, so let your doctor know right away if you experience any health changes when beginning treatment. Immune reconstitution syndrome may occur for a few weeks after a patient first starts taking Tenvir EM. Patients especially those with previous renal impairments should be monitored for evidence of toxicity and to ensure that the HIV viral load remains undetectable at regular intervals. Research on the safety and efficiency of Tenvir EM in patients with underlying liver disorders is inconclusive. Some patients with hepatitis B have experienced exacerbation of hepatitis symptoms after suddenly discontinuing Tenvir EM. Changes in distribution of body fat and bone structure have been linked to long term use of antiretroviral medications. Let your doctor know immediately if you notice any sudden changes in your body. 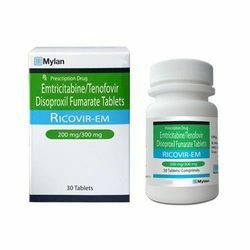 Ricovir EM is used as part of a regiment of antiretroviral medications to treat HIV-1 in adults.A single tabletl contains a combination of two anti-HIV drugs emtricitabine and tenofovir disoproxil fumarate; however, Ricovir EM must be taken with at least one other anti-HIV medication to prevent HIV from progressing to AIDS. Ricovir EM is taken orally once a day, at the same time every day, with or without food. Because Tenovir can cause renal impairment, patients with a creatinine clearance of 30 to 49 ml/min should only take one tablet every 48 hours, and patients with a creatinine clearance of less than 30 ml/min should not take Ricovir EM at all. Patients hypersensitive to either emtricitabine or tenofovir disoproxil fumarate should not take Ricovir EM. Other adverse effects have been reported by patients taking Ricovir EM, so let your doctor know right away if you experience any health changes when beginning treatment. Immune reconstitution syndrome may occur for a few weeks after a patient first starts taking Ricovir EM. Patients especially those with previous renal impairments should be monitored for evidence of toxicity and to ensure that the HIV viral load remains undetectable at regular intervals. Research on the safety and efficiency of Ricovir EM in patients with underlying liver disorders is inconclusive. Some patients with hepatitis B have experienced exacerbation of hepatitis symptoms after suddenly discontinuing Ricovir EM. Changes in distribution of body fat and bone structure have been linked to long term use of antiretroviral medications. Let your doctor know immediately if you notice any sudden changes in your body. HIV medications can help lower your viral load, fight against infections and improve your quality of life. But even if you take them, you can still give HIV to others. They're not a cure for HIV. The FDA has approved more than two dozen antiretroviral drugs to treat HIV infection. They're often broken into six groups because they work in different ways. Doctors recommend taking a combination or "cocktail" of at least two of them. This is called antiretroviral therapy or ART. Your doctor will let you know specifically how you should take your medications. You need to follow the directions exactly and you shouldn't miss even one dose. Or you could develop drug-resistant strains of HIV and your medication may stop working. Some other medicines and supplements don't mix well with HIV drugs, so make sure you tell your doctor about everything you're taking. Looking for Tenofovir Tablets ?